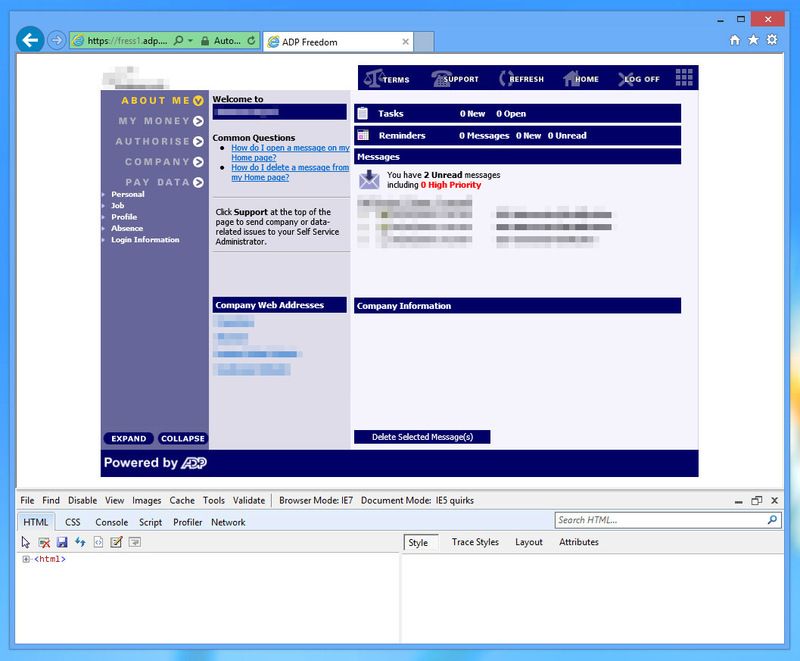 ADP freedom is an online payroll management system, designed years ago and somehow still in use. It does not allow you to log in using any recent version of Firefox* or Chrome, and now also rejects IE10. So, if you’re using Windows 8, you could be completely locked out of your own salary and tax information. Almost. Fortunately, there’s a trick. Here’s how to get past the utterly stupid “Unfortunately the browser you are using does not have a sufficient level of functionality to support this application” error. Open IE10 on the desktop. Click the settings cog icon on the right. Click ‘F12 Developer Tools’**. A Firebug-like panel will appear at the bottom of the browser. Click ‘Browser Mode: IE10’. Choose Internet Explorer 7 from the list. IE10 will now act like IE7, which will in turn switch into IE5-like quirks mode, and you’ll be able to log in. In my experience it works well enough to get access to payslips, but you’re entirely unable to book any time off work (brilliant). Once you’re done, click ‘Browser Mode: IE7’ and put the browser back to normal IE10 behaviour. * You can’t even trick it using the Firefox User Agent Switcher plugin – this will get you past login, but nothing inside the website will work.